For financial advisors, one of the biggest challenges faced is trying to grow their business beyond organic referrals because traditional marketing techniques can quickly become frustrating. Today’s world is filled with marketing, the average individual is exposed to multiple marketing messages and campaigns each day, making it harder to find effective marketing techniques and activities that lead to certain, measurable events. With all the clutter of marketing, many advisors wonder what can be done to help their advising practice stand out. With all the marketing that exists today, it is important for financial advisors and planners to focus their marketing towards their niche. Whether you are an advisor who hasn’t yet pinpointed their niche market or are an advisor who is considering changing targets, we put together a few niche marketing strategies to help advisors everywhere! Niche marketing has created a lot of buzz in the financial industry over the past few years, but many are totally aware of what the marketing strategy is or what it can do. Niche marketing is the art of specializing in a specific market by serving a particular client base with specific needs. Niche marketing can help a financial practice by gearing its services towards a specific buyer persona. 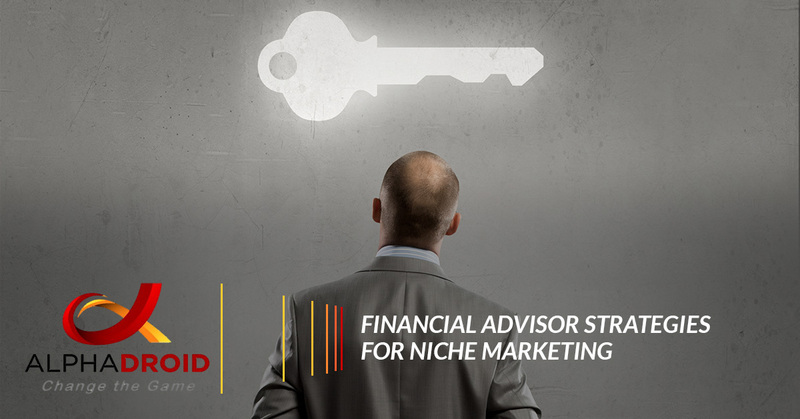 Advisors who utilize niche marketing generally have more success boosting client engagement and allow for a tailored experience that will likely create referrals. While many advisors, especially those who have been in the industry for a while, are hesitant to specialize in a specific niche, as they feel restricted to a narrow market. However, specializing in a niche is one of the most powerful ways financial advisors can grow their practice. And, with how competitive the financial advising industry is, niche marketing is becoming an effective solution for advisors to meet the needs of targeted groups. Why should financial advisors specialize in a specific niche? How can they benefit from it? The answer is simple — niche marketing works and it is effective. This marketing strategy allows advisors to direct all their resources into one specific goal. Advisors can better understand the needs and financial problems that arise with their clients, having a clearer image of the important trends specific to their market. No client is the same, but segmenting or classifying them will help advisors better dying their marketing tactics, goals, and solutions. There are many benefits that come with specializing in a niche, like being cost effective. Advisors with a niche generally have a deeper marketing budget because they are able to target specific outbound tactics. Inbound marketing will also be simplified, as advisors generally see less competition than they would in a broad market. Rather than spending time and money trying to appeal to multiple groups, advisors with niche markets can spend more time on providing in-depth and valuable content and services. Niches also allow advisors to build a stronger brand in their local community. By providing a niche experience for clients, advisors can provide them with a tailored and unique experience that fits their expectations. To develop a niche marketing plan, advisors must first determine their target market and create an extensive profile of the targeted audience. Determining a market will help guide an advisor’s specialized and strategic marketing and planning efforts, plus it will reveal additional marketing opportunities. Once a target market is categorized into an advisor’s niche, advisors will be better equipped to provide clients with tailored business solutions. There are many characteristics that can create a specific market, but defining the most rewarding traits will help advisors focus and develop their buyer personas. Check out some common niche categories, or markets, that financial advisors specialize in. Occupation is generally one of the primary characteristics of any niche marketing business, including financial advising. The type of job a client has allows advisors to better understand what types of education and challenges they may face. By considering industry trends, like pension plans, give advisors an idea of what kind of issues may arise soon and in the future. One of the most looked at traits in a marketing niche is one’s income and assets. This is because the profitability of each segment depends on the income and assets they possess. A prospect with a significant amount of the two will likely lead to a better outlook in profitability for the future. Targeting specific stages of life, or life cycles, can be a great segment for advisors to capture. With the number of people facing different life transitions, it creates many opportunities, whether it is a career, marital status, or a personal transition. Recently married couples who are in search of specific financial goals for their future, like buying a house. Prospects who are close to retirement and need professional advice about investing the final years of their wealth. Targeting personal characteristics is a way many advisors choose what niche to specialize in. Advisors can filter their search based on a group’s interests, their lifestyle, or opinion/views. Advisors who brand themselves to fit theses targeted characteristics will have an easier time building brand loyalty and creating lead generation. Each generation is different. Depending on what generation advisors target, their characteristics can vary, from general purchasing power and behavior to awareness and reach. Baby boomers provide an appealing mix of traditional marketing channels and technology adoption. Younger generations are more connected with technology, thus utalizing inbound strategies are the best way to reach and connect with them. Once advisors choose a target market and have identified the issues, they will want to create a tailored message to help address those issues. When doing this, financial advisors will be likely to find that their message becomes more persuasive to those who closely fit the targeted profile. A niche marketing strategy will allow advisors to better communicate their marketing message to their ideal, targeted prospects consistently over an extended period of time. This is because the targeted audience is generally smaller. Once an advisor’s targeted market hears about their financial advising services, awareness about their practice and brand will begin to generate. An easy way to do this is by organizing and executing marketing activities. Marketing activities could be a golf outing, an educational seminar, or a similar activity that will allow for networking and building relationships. When advisors choose to specialize in the detailed planning and investment needs of their targeted audience, they become the well-known expert in that specific area of specialization. Over time, satisfied clients will share their positive experience and help build an advisor’s reputation as a trusted financial resource. Focusing on a targeted market that shares similar financial investment and planning needs can be very beneficial for an advisor’s financial practice. Developing a niche can make streamlining services and managing revenue less of a hassle, and it can also help generate a higher profitability for a practice. And lastly, advisors who narrow their focus will have the opportunity to offer valuable, tailored services that many clients and prospects are in search of. As you can see, niche marketing is a beneficial marketing strategy for financial advisors. Developing a specialized marketing strategy can be a challenge, but once overcome it can create appealing benefits for advisors. A large portion of an advisor’s job is managing client portfolios, which can make it difficult for advisors to find time to develop a specialized marketing strategy. Advisors have been looking for a solution that will allow them to focus more on catering to their niche market and growing their practice, and less on client portfolio management and that solution is AlphaDroid! AlphaDroid is a premium investment portfolio management software that uses sector momentum measurements to help identify which market portions are likely to outperform near-term. Using asset allocation and algorithmic trading strategies, AlphaDroid analyzes, constructs, and compares client investment portfolios. To learn how AlphaDroid can make portfolio management easier and create additional time for advisors to focus on more important things, like developing a niche market, contact the team at AlphaDroid today!